Two of the most popular options in restorative cosmetic dentistry today are veneers and Lumineers. Both are made of thin, durable porcelain material and both can provide natural looking, long lasting results when prepared by an experienced, competent dentist. In order to determine which option is best for you, Dr. Kemmet, a Denver cosmetic dentist, will consider a variety of circumstances which include your unique dental history, overall health, personal desires, expectations, and her professional understanding of your particular situation to create an beautiful final result. Resistance to staining. A significant advantage is in the nature of their material. Since porcelain is a ceramic and therefore glass-like, the porcelain surface will be extremely stain resistant. Can be used to repair minor tooth imperfections and defects. Teeth that have small chips or whose surface is worn or misshapen are often good candidates. Can be used to cover over and conceal fillings that have become stained or discolored. Old fillings and previous attempts at cosmetic bonding that have become discolored can be easily corrected. Can be used to make color changes for teeth that have permanent stains. Some teeth are naturally discolored. This includes teeth that have tetracycline, fluorosis staining, and those that have darkened as a result of physical trauma or root canal treatment. In some cases they can be used as alternatives to orthodontic treatment. They can be used to close the space (called a “diastema”) between a person’s teeth. In cases where teeth are slightly crooked to extremely crooked, they can be used to create an instant orthodontics effect. Dental LUMINEERS® are different than a traditional veneer in the way they are manufactured and placed. LUMINEERS® is a brand of porcelain veneers. (DuraThins™ is another brand with similar properties and application). A LUMINEERS restoration is as thin as a contact lens and placed over existing teeth without having to remove tooth structure. Like traditional porcelain veneers, LUMINEERS restorations are an excellent cosmetic solution for stained, chipped, discolored, or misaligned teeth. 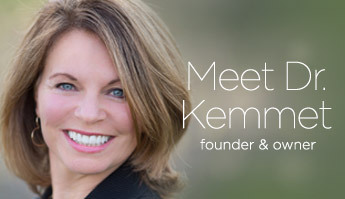 Boulder cosmetic dentist, Dr. Lori Kemmet, provides visual consultations with anyone considering dental veneers, porcelain laminates, and LUMINEERS. Her team offers these consultations at no charge.